This episode corresponds to Lesson 6 of our online course. In this sixth episode, Head of Composting at Novozymes Frank Franciosi gives us an in-depth view of the operations at his compost production facility in North Carolina (USA). 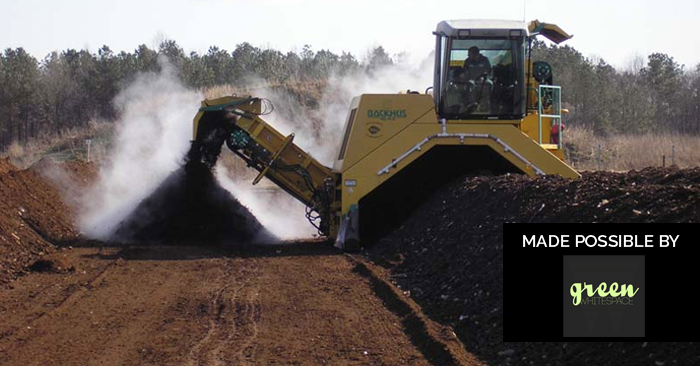 He shares with us his thoughts on marketing compost correctly and his strategies for setting up a successful facility. Thank you to Green White Space for making this possible. Green White Space is a not-for-profit enterprise specialising in media and social innovation. Find out more on their website. FF: Yeah, I actually got into this business, didn’t know anything about composting, and had answered an ad in a paper to manage a composting facility in North Carolina. At the time I knew nothing about what composting was all about, other than the normal, basic biology and science behind it. And I got involved with the US Composting Council, which was a good resource for me: I met a lot of people, visited some sites, and really learned how to do it on a commercial scale. And I started this facility, then got out of that facility – worked there for about four or five years – and started another facility, which is working with Novozymes. At the time, they were looking for alternatives for their residuals coming out of that plant. It was an alternative for them. Traditionally I lot of the biotech industries do a lot of land application of their residuals and put it on to farm land – which is, you know, the cheapest way to do it. However, what has happened is a lot of the area is starting to get more urban, so we’re losing that farmland; so this was another way of actually looking at more of a sustainable approach for the residuals long-term. EM: And how much residuals do you take from Novozymes itself? FF: we take about thirty-five to fourty percent of the residuals coming out of the process – the plant in Franklington which is just North of Raleigh, North Carolina. EM: Right, and how much do you produce then? FF: We produce about thirty-five thousand cubic yards a year of finished product. EM: Right, and how much is that in tonnes? FF: It’s roughly about half, because it weighs about a thousand pounds per cubic yard – a thousand pounds a cubic yard is kind of the number that we always use. EM: Cool and tell me a little bit about the facility itself: the location, the size…that kind of thing. FF: Yeah, the facility itself sits on an eight-acre site. We have about five hundred acres and we’re smack in the middle of that parcel so we’re surrounded by wooded area. It’s very much a rural area, so we don’t have issues with, you know, neighbourhoods encroaching on us because we own the land all round it (laughs). EM: Sounds ideal for what you’re doing then. EM: Could you talk us through, then, the general process of composting at your site and the equipment that you use? FF: We have, you know, we start off with the front-end loaders. They’re our measuring cups (laughs), okay. And then we have a big mixer just like you mix when you’re baking a cake. It is a Kuhn Knight – it holds about thirty-five cubic yards. It’s a commercial, industrial mixer so this is a rotating reel and it’s got augers in it that are against it, so… And then there’s a conveyor belt that comes off that mixer. We have a truck that parks underneath they conveyor belt, and the conveyor belt conveys the mixed material into the back of the dump truck and then he takes it out to form the windrow. And then the windrow, you know, they’re about twelve feet wide and about six feet high. The turner – it’s a Backhus, a German turner – and we turn based on meeting our pathogen reduction: basically one time a week, or once every five days. And then taking temperature measurements every seventy-five feet, and we do that with a manual probe. And we use a compost manager system that’s developed from Green Mountain Technologies so we can datalog that back into our PC, so we can track the temperatures. So after sixty/sixty-five days we’ll pull that windrow up and we’ll feed it to a screener. We have a Backers star screen, it’s a rubber star screen, so all the fine material falls in between the stars, and all the large runs up. The oversize, as we call it, we take that and it goes back into the front-end of the process. And then the fines, we can screen to whatever particle size we want based on our sales demands and what our inventory is. And then we’ll stockpile that material and we’ll let it cure for another sixty days. So most of our materials are at least one hundred and twenty days old before we sell it, depending on the season: our Spring – we have a big Spring sale season which starts in March and May and then it dies down in the middle of the summer months as it gets really hot here – then it picks up again in the Fall. So we have, like, pretty much a six-month sale season, that’s pretty robust. EM: So, is most of the materials you take from Novozymes or is there any other places you take them from? FF: There’s a wood-moulding manufacturer that we take the sawdust from. And then there’s five different municipalities in the area and they bring us yard waste. And so, we have to grind that, some of it comes in pre-ground and some of it we have to grind, so we have a horizontal Rotochopper grinder and we’ll grind that down into three inch minus material. And we sell everything bulk, we don’t bag anything. So everything goes out in large tractor-trailer loads. EM: Cool, and to give us an idea of how it sells – what are the markets that you sell to, are there many? FF: So, you know, the traditional markets that we sell into are the landscape construction, or landscape installation, markets. We also sell it to the nursery market, and we do sell it to some golf – the golf industry. And then the new area that we’re in is…it’s called Green Infrastructure, I don’t know if you’ve…it’s also called Low Impact Development, and there’s some new rules and regulations that, you know, if you build a building now you have to estimate how much storm water flow you’re going to have – and you have to catch that one-inch rain event. So we’re starting to sell compost into those markets, because compost is very…it has a high absorption rate, it’ll hold a lot of water, it’s basically a natural fertiliser and it’s a great growing media. So there are several areas where compost is being used – green roofs is one of them. You’ve heard of rain gardens or bioretention basins, green swells…. And these are all different applications within that Green Infrastructure category. So that’s happening here in the US. And then, more and more we’re seeing compost being incorporated into the soil, so there’s a better percolation, a better infiltration rate into the soil – and that’s a whole new market, we’re just kind of scratching the surface. And then another market is erosion control: which is preventing the sediment from running off on construction sites, and that has been a huge market for us just in the recent years. We’re just starting to sell a little more into agriculture; agriculture believe it or not is not a big market for us, but more and more people are seeing the value of using compost. And then there’s a big push here in the US to grow local, buy local. So we’re seeing more smaller farms, and people are now more interested in keeping their farms, but growing organic and being able to provide that to a farmer’s market rather than a grocery store. EM: That’s amazing yeah, that’s very promising. And you have a number of different products for different uses – I presume it’s high-quality compost you’re selling? FF: Yeah, we…you know, because our feedstock’s are very consistent, we get a very consistent product on the back-end. We don’t change our process – so that’s been a big part of us is keeping that quality control on the process side and then also on the finished product side. And then we screen the different sizes. We screen really, really fine mesh – quarter-inch material – you know, very fine, and that goes to the golf course market, that goes to that green roof market. And then we screen a half-inch/three-eights inch product, which is pretty general purpose: it can be used in potting media, it could be used as a mix, it could be used directly into the garden as an additive. And then we screen really at a larger size, which is coarser, it has a lot more of the woody material in it, it’s got more mulch content in it – and that’s used for erosion control because that’ll hold the slopes, just like a mulch will hold and give you temporary stabilisation of that slope. And then we do some mixes: a lot of people, they don’t realise the value of the word compost so they’re used to buying topsoil – and we don’t sell topsoil because that’s not sustainable. But we manufacture topsoil; so we take a portion of compost and we blend it in with some sand and some silt and some clays and we make what I call and engineered topsoil, and that’s a very popular product because when people say: “well, do you have topsoil?”, and I say: “no, we don’t have topsoil, but we have engineered topsoil”. And then they go “well, what’s engineered topsoil?” and it’s basically a topsoil that we create by blending other ingredients in with it. And that’s been a huge market boom for us, because again people are more used to buying topsoil. But when they buy topsoil they buy weed seeds, they buy…I mean, who knows what’s been sprayed on the field…so it’s an unknown but, see, they think if it’s black it’s good, because if it’s dark then it’s rich. But when you look at the analysis of topsoil here in North Carolina, there’s really only one percent organic matter in the soil. And our compost has about sixty to seventy percent organic, so it’s very high in organic matter, which is really the secret to compost, is that: all in the organic matter, and the humus. EM: Right, and why do you think that there’s so little understanding about compost then, in a general sense? FF: So I think, you know, it’s all how it’s marketed. And a lot of compost is sold in the US not as compost, but as a soil supplement or as a topsoil, or you know, a manufactured topsoil – and that’s just the stigma that people just have to get over, over time, I think. One of the challenges that we have in the industry is to monetise the value of compost because if you took each and every one of those components and you started adding, not just the value of fertiliser value, but the cation-exchange capacity, organic matter, biological activity…but people don’t value that, they just look at NPK (nitrogen, phosphorous, potassium), they don’t look at the overall picture of soil health. I think part of the problem is, you know, the commercialisation of fertilisers – the brand-naming of fertilisers – you know, “hey it’s Springtime, time to go out and get your spreader and….” well, you know, we don’t have that market appeal. We’re trying to work on people getting back to basics. One thing that the recession has done is that it has increased awareness of waste, so people aren’t wasting as much. The other thing is, people are now growing a lot of gardens themselves. So that’s been a big push for us: community gardens are growing all over the US, there’s a big push for urban gardens. You know, so I think it’s an awareness thing and I think we need to do a better job at educating the general public as well as school kids because if they learn it, eventually it’ll become common practice. EM: Yeah, so get it into the school curriculum. EM: And do you know of any other businesses or companies that are composting their organic waste? FF: I don’t know of any right off my hands that I could think of, but you know, that changes all the time. I know there’s some egg processors that are doing it here in North Carolina, there’s some tobacco companies that are looking into doing it with their stems – so there’s other industries, I don’t know if it’s just biotech per se. And a lot of it, I tell you, I’ll be honest with you: a lot of it, and it was a big bridge that I had to cross, was the big liability issue here. You know, “oh, what’s the liability, you know” and I think a lot of the corporate people say “well, that’s not our business, we’ll, you know we’ll just send it to a facility”. So a lot of facilities are probably taking similar material like we’re generating and composting that material. There’s a plant not far from us that makes amino acids, and I know that they have a left over residual, and they’re taking that and they’re shipping it to a competitor of mine, and they’re composting it. So, directly setting up a facility on-site, I don’t think there’s a lot. But I think there’s a lot going to compost, but you just don’t know about it because they’re private contracts they’ve arranged. EM: Yeah, well it’s good so long as they’re composting it! FF: That’s right! Yeah, that’s right. EM: So what do you think it takes to get started on a facility like your one? FF: You know, it’s very much baby-steps. And I think the approach was: prove it on a small scale; figure out what your technology is. The obstacles that I look at are: of course, money is one (laughs). But you know, location is really important. We don’t really have an odor problem, but you know, when you’re handling stuff like food waste and some of the other materials…if you’re handling manures and there’s dairy farms all around you – there’s not an odor problem (laughs). But if you’re handling dairy manure or food waste and you’re surrounded by a housing development, then there’s an odor problem, right? So I think locations are important. You want to be near a major road, but you don’t want to be right on the, you know, you want to be off the major road. You want to be in an area that’s pretty much you know what the growth around you is going to occur. Like, I know there’s facilities that have been around since the 1970’s and what is happened is that everyone sold the land around it, so now it’s all housing – well, now you have all these odor complaints. Well, it was there since the 1970’s, I mean…. Yeah, so location’s important and, you know, storage issues, seasonality – those are the big issues. And then, you know, how you plan your facility. You know, looking at the process flow and how materials come in, and you want to make it as linear as possible. Just like, you know, an auto-manufacturing line – the line’s straight. So you want to have an engineer to be able to figure that out, but you also want somebody that has knowledge in the industry. It’s a lot of materials movement, so if you want to move something a short distance, you could move it with a loader. If you want to move it a little bit longer than that short distance, say…sixty/seventy feet, maybe it’s better to use conveyors or a truck, like a dump truck, or a conveyor and a truck. And then, you know, your run-off: you want to make sure that if it’s an outdoor facility, that you’re capturing that run-off. So contamination is also an issue. So those are the big things. And then, sizing your equipment for your facility, so like, you know it’s really better to start out with leasing equipment because the life expectancy of that equipment may be short: like a grinder that takes a lot of beating. So all those little things on figuring out what the movements are and how to increase your efficiency in those movements are really important. EM: Amazing, great advice. And would you say that it’s economically viable for businesses to go down this road? FF: Yeah, I think it is. You know, the model in the US is: a lot of composters make the majority of their money on the front-end which is tipping fees, not so much on the back-end. It may be eighty-twenty or sixty-forty. And I think that it could be a good business, but it all depends on what those…you’re competing against the landfill, so your fees have to be better than the landfill so you can bring that business in. You want to try to get as clean feedstocks as possible, so contamination is an issue there because if you’re picking out a lot of trash and stuff, that’s just more processing time and more equipment. If you make a really good product on the back-end then you can recoup more of your profits on the back-end. So, you know, I think it can be. I know the other model is the AD model, and that works really well where you have high-density populations, small footprint, high tipping fees – so you can recoup some of that in the tipping fee, the energy generation, and then the final product. What I worry about is there’s a lot of AD plants out there that…they consider everything but the final product, and you know, they’re saying “well we can sell it as a digestate”: in a lot of cases here in the US you can’t because you have to treat it for pathogens, you got odor issues, it’s not a mature product. So it’s more of a cost than it is a profit. So, I’d like to see that model work, where they take the digestate on the back-end and they compost the digestate too so they make another value added profit. EM: Yeah, absolutely, that makes sense. And finally, is there any last words of advice that you’d like to give? FF: I’m a believer that if the markets are there and the markets are steady and there’s a really good demand for the product, that we’ll see more facilities expand, we’ll see more facilities being permitted, because the economics working out – start working out a lot better, because you know. A lot of the composting that was done early in the US was mandatory state mandates on keeping yard waste out of the landfill, which was a smart thing to do because it’s useless in a landfill. But they didn’t have the infrastructure, they didn’t have the training and the technology to do it right, to make a product. And you see a lot of municipalities kind of getting out of the composting business, and you see a lot more private-public partnerships being developed. Because I think we understand it more as a manufacturing process – and that’s the attitude you have to take, which is “I’m not just keeping this stuff out of the landfill, I’m making a product”. And, you know, if you make a high quality product, obviously you can demand more price for your product. EM: Great, great stuff. Frank, that’s all we have time for today, thanks for coming on. FF: Alright, thank you Eleen.